(February 28, 2014) Longtime SoulTrackers know that the Chi-Lites are among our all-time favorite groups. So we're particularly distressed to give two pieces of bad news today. Chi-Lites founding member and leader Marshall Thompson reportedly suffered a stroke while attending the SoulTrain cruise. Thankfully, he is now stable and in the hospital. We're sending out our prayers for a full and speedy recovery for our good friend Marshall. Sadly, group member Frank Reed, who, along with Anthony Watson, took over lead vocal duties after the retirement of Eugene Record, has died. Reed was a talented singer who joined the group at a difficult time and served admirably through years on the road. He will be missed. In the 60s, Smokey Robinson virtually reinvented the sweet soul ballad and paved the way for a number of groups that would make the early 70s a ballad lovers dream era. And no act epitomized that genre more than this hard working group from Chicago with an underappreciated musical genius at the helm. Like many popular soul groups of the 60s and 70s, the Chi-Lites found each other as teens, singing together and apart in various groups in their native Chicago until joining together as the Hi-Lites in the mid 60s. By the time they signed with the local Brunswick label in the late 60s, they had added a "C" and become the Chi-Lites. The Chi-Lites marriage with Brunswick bore fruit quickly, as they had their first R&B hit in 1968 with the sweet ballad, "Give It Away." While their early Brunswick songs were typical of the Smokey-influenced soul group sound of the late 60s, over time the Chi-Lites developed their own unique sound around the writing and production of lead singer Eugene Record. An immense talent, Record distinguished the Chi-Lites from other silky soul groups like the Stylistics and Blue Magic by balancing sweet soul ballads about loneliness and vulnerability with funky thumpers about race relations and social justice. In retrospect, how could an album boast the then-radical "Give More Power to the People" alongside the almost saccharine love song, "I Want to Pay You Back?" The Chi-Lites moved from "soul superstars" to simply superstars in 1972, as two group ballads rocketed to the top of the charts and became among the most memorable songs of the decade. "Have You Seen Her," with its sad opening monologue, took the pop world by storm, only to be topped by the forlorn harmonica lead and impeccable harmonies of the group's greatest song, "Oh Girl." Internal group problems reduced the Chi-Lites to a trio in 1973, but the hits kept coming. "Homely Girl," "Stoned Out of My Mind," and "Toby" kept the group near the top of the R&B charts, though, by 1975, crossover success had waned. Due to serious financial difficulties at Brunswick that would ultimately kill the label, the group released its final Brunswick album, "Half A Love," in 1975. Eugene Record left the group in 1976 and released three solid but underrated albums for Warner Brothers. 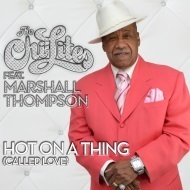 Marshall Thompson continued to lead a revamped Chi-Lites line-up through the remainder of the 70s, dropping two surprisingly good albums (Happy Being Lonely and The Fantastic Chi-Lites) without Record's participation. In 1980, the most popular Chi-Lites lineup, consisting of Eugene Record, Marshall Thompson, Squirrel Lester and Craedel Jones, reunited and released the "Heavenly Body" LP. The reunited group continued on for four more years and three more albums on various labels, with limited chart success. In 1985 Eugene Record again left the group, but his compositions have continued to find the spotlight, being covered by dozens of artists from MC Hammer to Paul Young. He also quietly released an excellent gospel album in 1997, entitled "Let Him In." The Chi-Lites had a big year in 2004. Their early 70s hit, "Are You My Woman," was remade by Beyonce Knowles as the across-the-board hit and Grammy winning, "Crazy In Love." And their 1974 song "That's How Long" was used as the backdrop for one of the cuts on Jay-Z's Black Album. Also, the group reunited with former lead Eugene Record for the March 2004 PBS Soul Music special and they sounded great. Sadly, Record died in July 2005 after a long bout with cancer. He will be greatly missed. Marshall Thompson and Squirrel Lester, along with more recent addition Frank Reed and the group's first female member, Tara Thompson, continued the Chi-Lites tradition, recording sporadically and touring unceasingly over the last two decades with other classic soul groups such as the Stylistics and Ray, Goodman and Brown. In 2005 the group released the single "Mother Love" and followed the next with with a Christmas song. Sadly, Lester died in January of 2010, leaving Thompson the sole remaining founding member of the group. Lester was replaced by Fred Simon (formerly of the Lost Generation). Marshall Thompson has been working with a number of younger acts in the Chicago area and is reportedly forming a new record company with Jackson family patriarch Joe Jackson. The Chi-Lites' have left a legacy of great harmonies and classic material that continue to influence today's pop and soul artists and still wow soul music fans after nearly 50 years. Fortunately, there are many great group retrospective discs out there, with virtually all of their 70s music and some of their 80s work being represented. Many thanks to Gary from Disco, Soul, Gold for letting us know about this.